X-ray (blue), and optical (red) images superimposed. Within the depths of the Crab Nebula there lies a beast. It is an object that is only 19 km in diameter and emits pulses of radio waves at a rate of 30 times per second. These pulses are so powerful that they light up the entire nebula. This object is the remnant of a supernova explosion, one of the most energetic events in the entire universe. 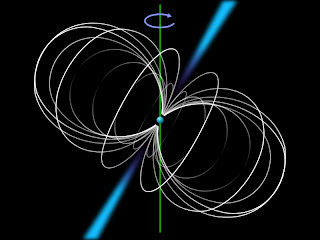 It’s a pulsar—a rotating neutron star. A star so dense that a teaspoon of it would have a mass about 900 times that of the Great Pyramid of Giza. It’s so dense that the atoms within it have collapsed in the gravitational crush to the point where electrons have been pulled into the nucleus converting protons into neutrons. A pulsar creates a magnetic field a million times more powerful than earth’s. It also creates powerful beams of electromagnetic radiation emanating from its two poles. The reason that pulsars pulse is because they are rotating. As they rotate, we detect these jet of radiation at regular intervals, much in the same way that a lighthouse works. come in and out of sight. 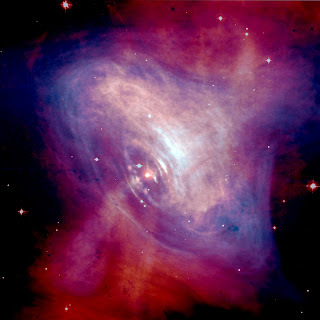 The Crab Nebula pulsar was formed in the aftermath of the supernova explosion of 1054 AD and was recorded by Chinese and Arab astronomers at the time. For two years it was visible to the naked eye and at its peak it was the second brightest object in the night sky, being surpassed only by the moon. Thanks to these ancient astronomers this was the first recorded instance of a supernova explosion. The first pulsar was discovered in 1967 by Jocelyn Bell and Antony Hewish. At first they were perplexed by the regularity of the pulses, and named their find LGM-1 which stands for little green men. Some thought that pulsars might be radio beacons from alien civilizations and it wasn’t until about a year later that astrophysicists were able to determine what was really going on.